Stop craving for attention. Start giving full, undivided attention. 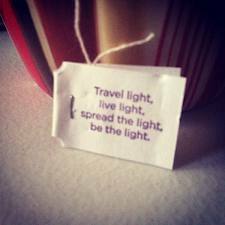 In this crucial shift in thought and action lies the secret to bliss. Picture yourself at home. You have done something nice, maybe made a great meal. Your spouse comes in. Throws her belongings on the carpet, rushes into the kitchen, grabs a juice and some cookies, completely oblivious of the entire spread laid out on the kitchen counter. You are wondering why she is so uncaring. You crave for that “Hey, what’s all that for dinner tonight?” conversation. And then when it doesn’t happen, you sulk. You reply in monosyllables and say good night and go to sleep. What happened there? In your craving for attention, you missed out on giving complete undivided attention to your spouse: maybe she was fatigued after a long day at work or maybe she was unwell or maybe she’s too stressed out. How magical would it have been had you started by asking, “Is there something that I can do for you?” or “Would you like to taste your favorite pasta that I have whipped up with pesto sauce?” The same attitude and approach applies in all situations in Life. At a busy airline counter, you blow your top at an agent who has not looked up at you because she’s perhaps been busy, overworked, or is having a relationship crisis. But you craved for a ‘Good morning there, how can I help you?” and since that didn’t happen, you lost your cool. Another instance: In a meeting to discuss the strategy for your company’s new product, you are fourth in line to make a presentation. But because your CEO is applauding the previous presenter, you have lost your focus and are now worried if your work will be celebrated similarly. In your craving for attention, which breeds anxiety, you lose your flow, stumble through your slides and perhaps even evoke a reprimand from your CEO for poor preparation. And you go back home, behaving like that spouse who grabbed the juice and cookies, missing to notice the great meal spread out awaiting your arrival! You see how one thing leads to another. 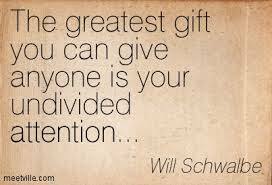 The solution is to give complete undivided attention to whatever you are doing. Just that one thing. Nothing else must matter. When you do that, systematically, in each moment, you will become one of the greatest listeners in the world, and you will see only beauty, perfection and joy in everything. All the time. When we are craving for attention, we are really being judgmental. “Oh, he doesn’t care!” This really means you wished he cared. “No. I am not wanted here.” This means you are craving to be wanted. Undivided attention minus judgment, minus the craving, delivers love. And where there is uninterrupted love for whatever you are experiencing: a person, an object, a flow, a situation, you will feel bliss. You will be bliss. 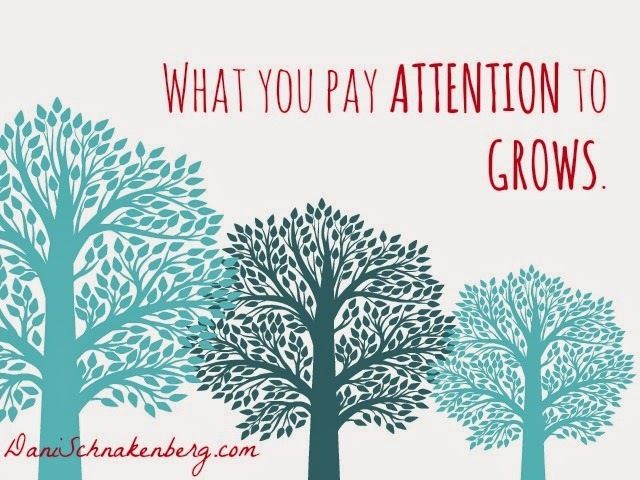 Whatever we give attention to in Life grows. You and I are who we are because of what we have focused on. If we have dwelt on mundane issues, we will be stuck in the rut. If we have looked at the magic and beauty of Life, we will be surrounded by people, events and scenarios that make us happy. For you to understand how this works, you must know what’s important for you in Life. And you must shift your attention to those things, those pursuits that are really important. When you look at the roads, the unpicked garbage and the street people or when you read the headlines about selfish, corrupt people you will end up being cynical. This cynicism will grow. Making you bitter and angry. Instead, if you focus on the good that people do each day to make your Life possible with a degree of comfort you have chosen, you will find gratitude welling up within you. This gratitude will make you both peaceful and prosperous. If you focus on how it’s possible for your child to go astray in this big, bad world, that feeling of insecurity will chew you up. It will haunt you even in your sleep. Instead if you focus on the joy of having brought a new Life into this world, through you, and allow that goodwill to grow within you, you will see your child as a wholesome individual charting her own path in this world. In Life, all things you seek and that comfort you are mundane at one level: the money you have, the control you think you have on your circle of influence, the respect you get from society and other such similar stuff. And yet what you have and don’t think of always are the most important at another level: this Life, your family, the ability to touch, see, feel, hear, express….Give your attention to what’s more important than to what comforts you. 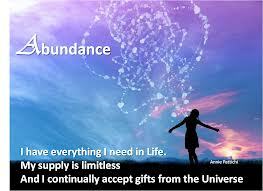 You will then invite abundance unlimited into your Life!